Svartisen Glacier is the second largest in mainland Norway, after Jostedalsbreen, and one of the most dramatic sights on the coast. 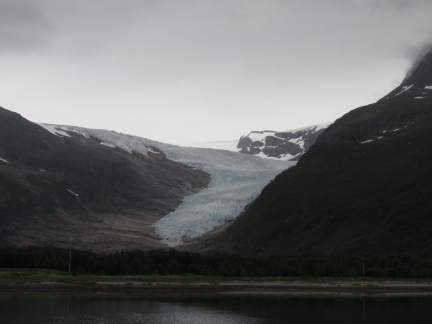 Ending at only 65 ft (20m) above sea level, it’s the lowest of any mainland European glaciers and among the most accessible. 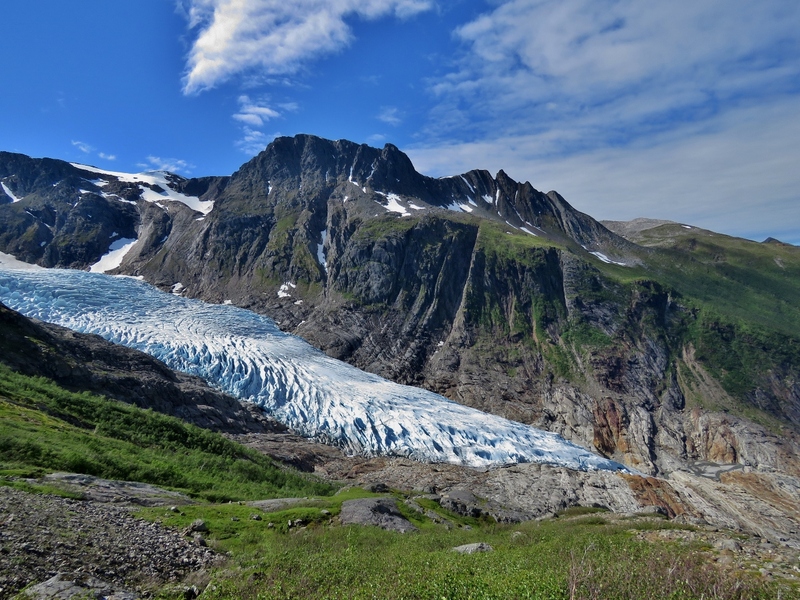 And if spectacular glacier views aren’t enough, nearby is the trailhead for challenging hike to the 4770 ft (1454 m) Helgelandsbukken. 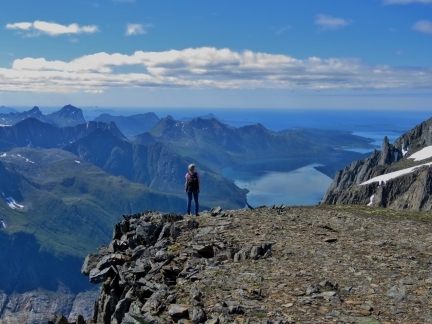 The views from the summit are astonishing—we could could see all the way to Lovund and Traena to the west and the Lofoten archipelago to the northwest. We didn’t think anything could top Dronningruta, but Helgelandsbukken definitely is more spectacular, and more strenuous. The Kleiva light tower, prominent to our east as we round the Stott peninsula. Dramatic 1489ft (454m) Hortinden rising just west of Reipa. 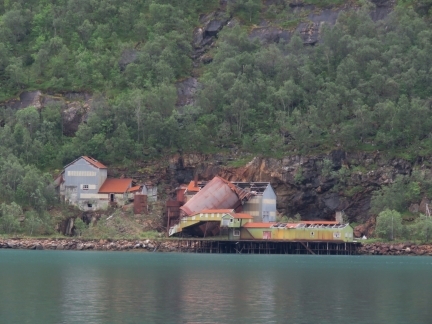 We haven’t seen many ruins in Norway. People seem to rebuild or tear down anything that is no longer functional. 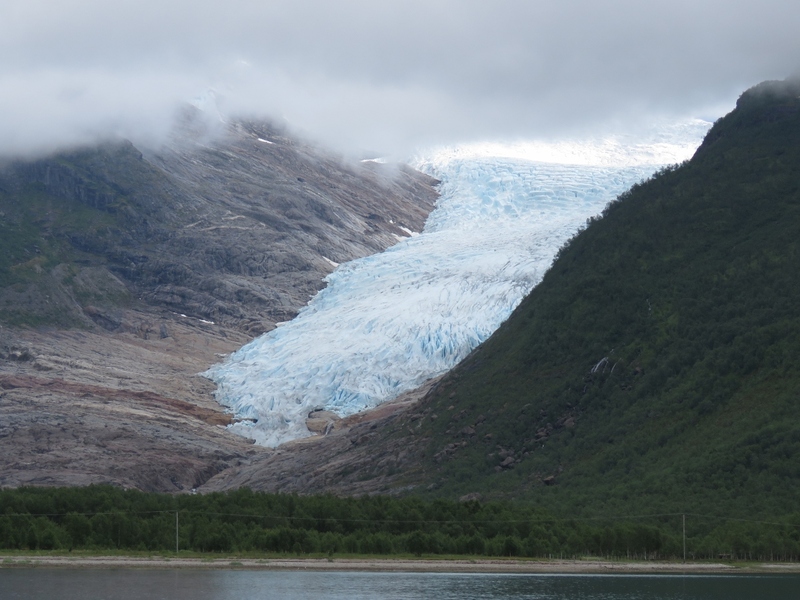 Svartisen Glacier is the second largest in mainland Norway after Jostedalsbreen, and one of the most dramatic sights on the coast. 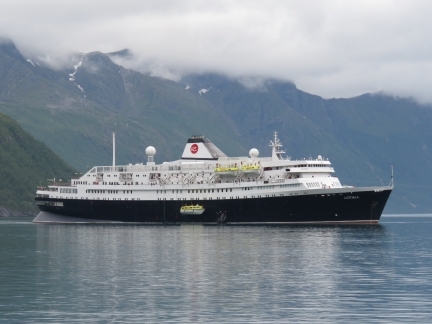 Cruising up Holandsfjorden, Svartisen suddenly looms into view at the head. 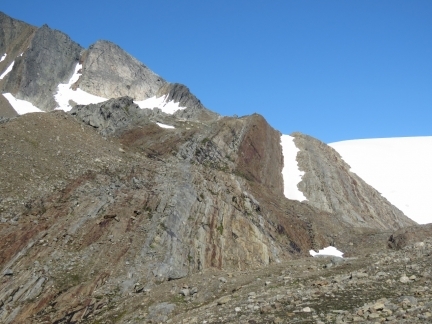 It ends at only 65 ft (20m) above sea level, the lowest of any mainland European glaciers. 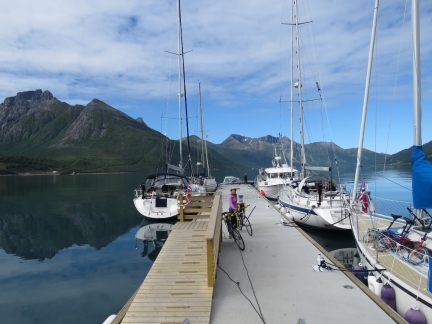 The guest dock at the head of Holandsfjorden was full, and even if there was a spot, we weren’t keen on the likelihood of rafting. 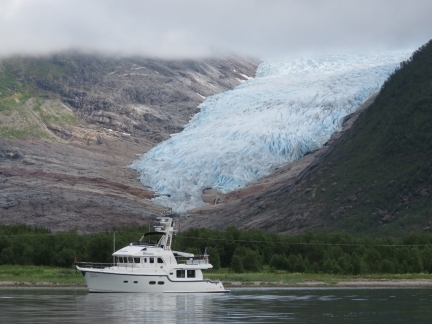 Like most fjords, the head of Holandsfjorden is initially very deep and then shelves off quickly at the head, making anchoring difficult. 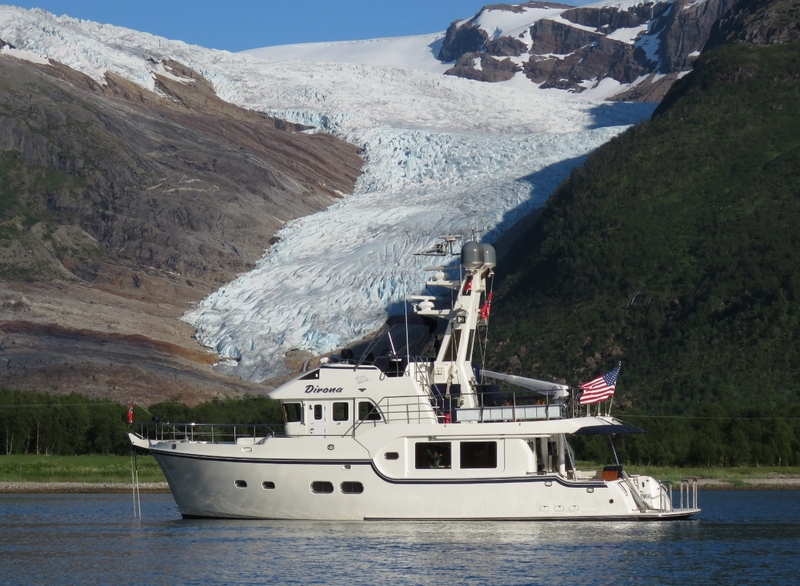 But we found an anchorage in 113ft that had a reasonably even bottom, room for 350ft of rode, and excellent holding with a fabulous view to the glacier. The clouds lifted a bit this morning for an even more dramatic view to Svartisen Glacier. 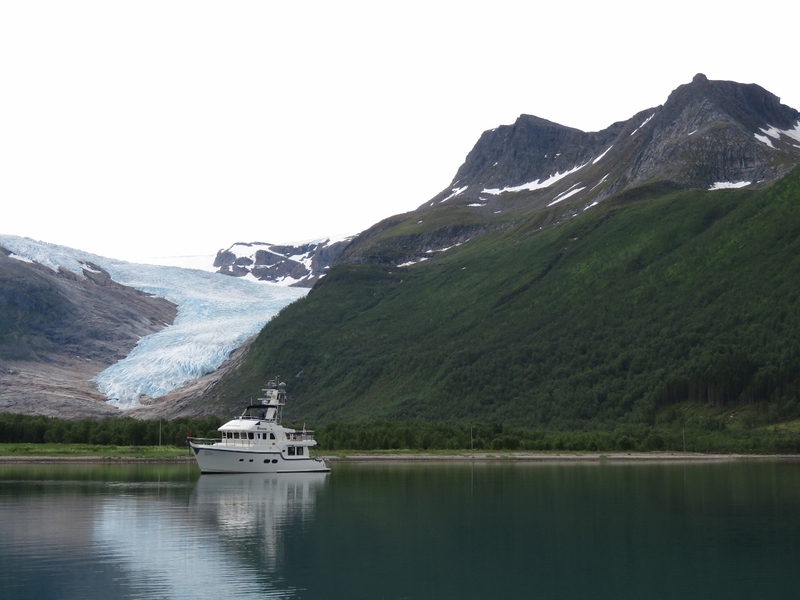 The view east down Holandsfjorden is pretty spectacular even without the draw of Svartisen Glacier. 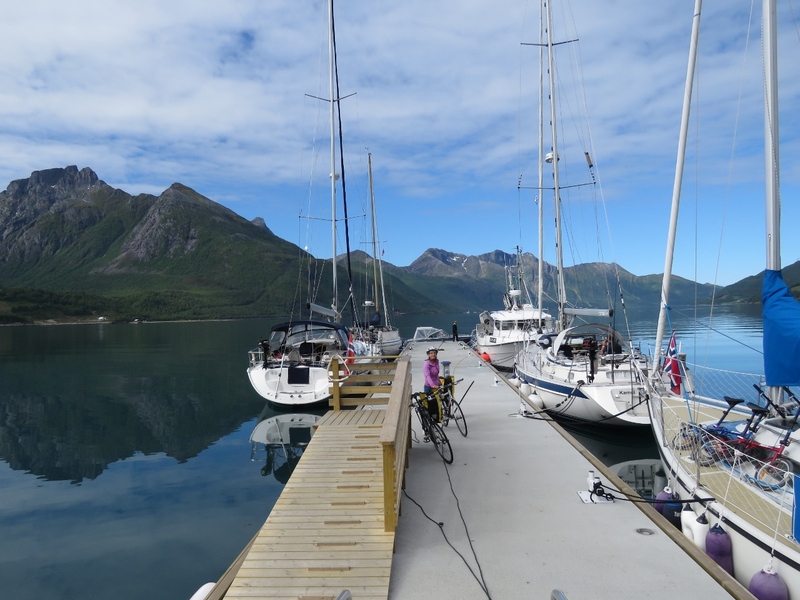 We’d brought our bikes ashore to cycle the roughly 2 miles (3km) to the Helgelandsbukken trailhead at the base of Svartisen Glacier. The ramp on the left is for a ferry boat that provides regular summer service from Holandsvika near the main highway across Holandsfjorden. 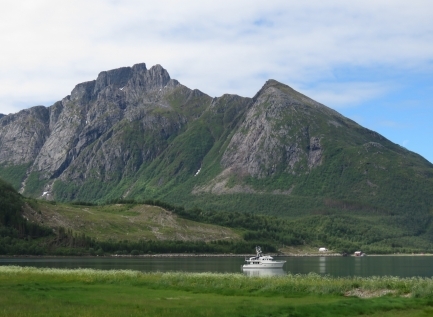 View to Dirona anchored at the head of Holandsfjorden. 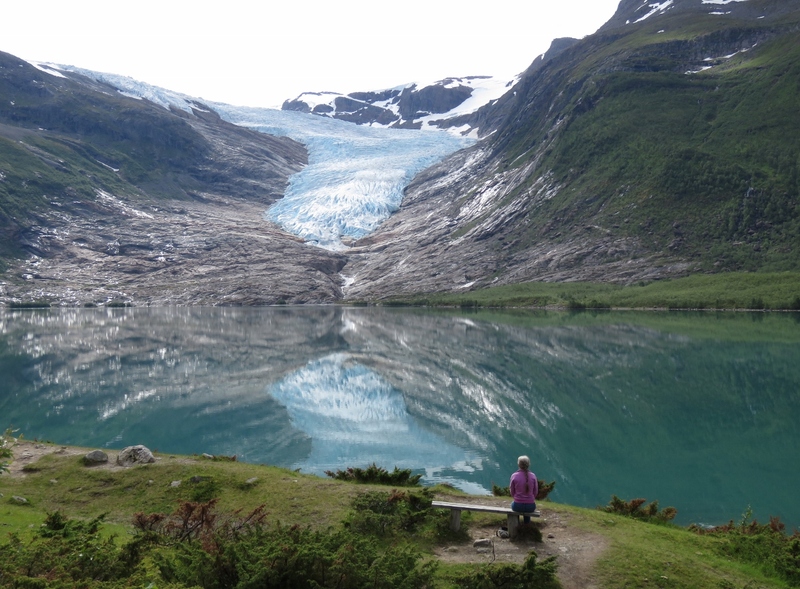 A spectacular view to Svartisen Glacier reflected into the lake Svartisvatnet. The visitor center here is very popular, with cafe that has views to the lake and glacier. A bus often runs to collect visitors arriving by ferry. 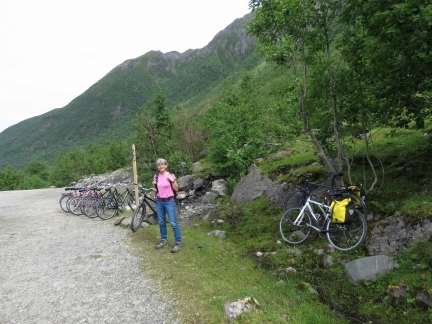 Leaving our bikes with at least a dozen others at the trailhead to Helgelandsbukken. Most are rentals from a company at the ferry dock. Enjoying the view across the lake Svartisvatnet to Holandsfjorden from 523 ft (159 m) up. 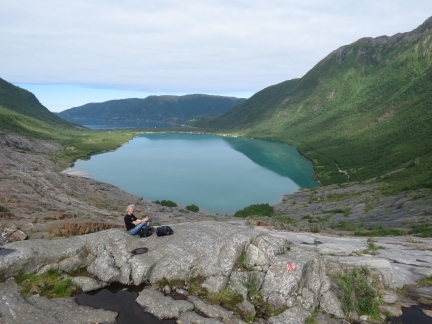 Dirona is the white speck just visible across the isthmus between the lake and the fjord (click image for a larger view). 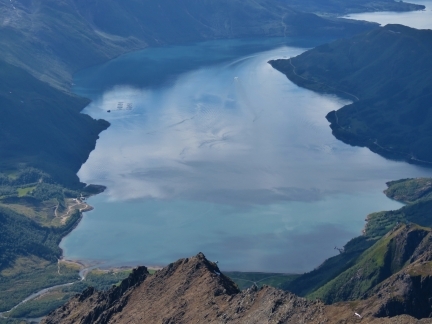 The view to Engabreen, the extension of Svartisen visible in Holandsfjorden, from 1510 ft (460 m) up. We’re gaining altitude quickly—1000ft (300m) in under 45 minutes. 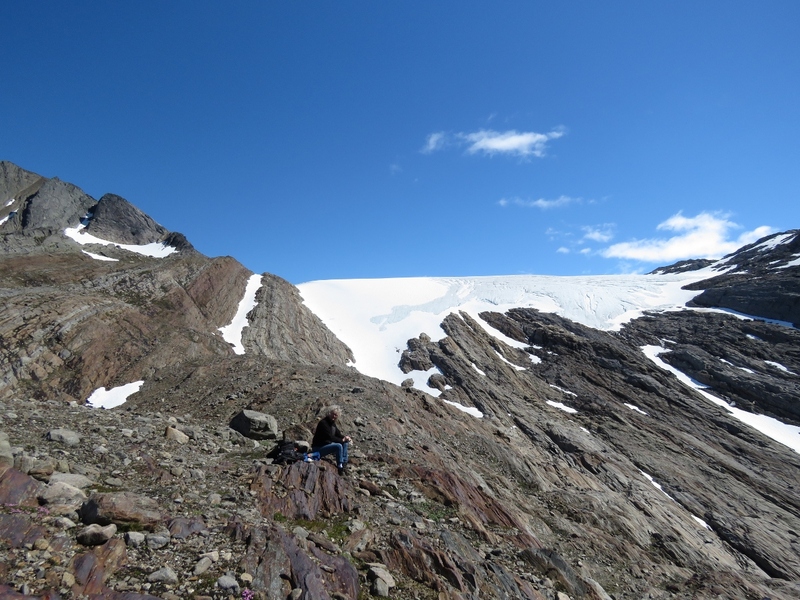 Taking a break beneath the main portion of Svartisen Glacier. We’re climbed 2,891 ft (881 m) in just under two hours. 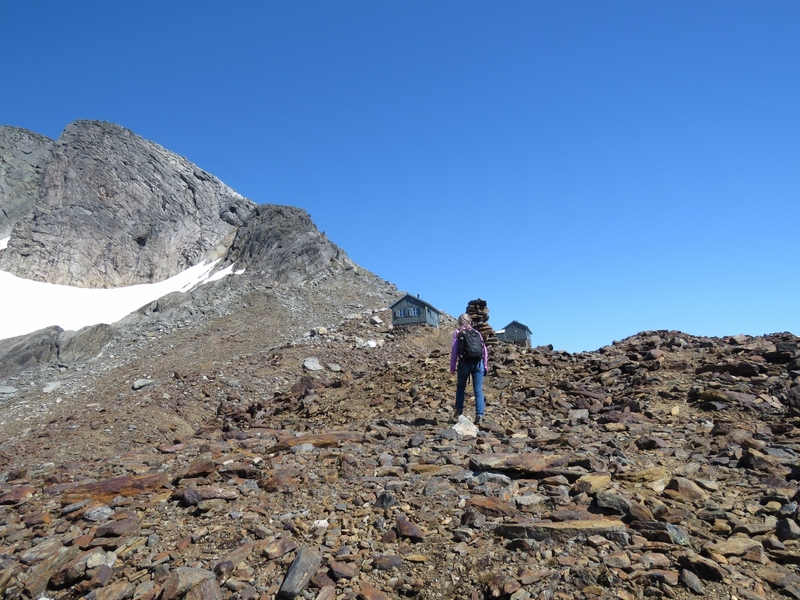 We expected we were getting pretty close to our intermediate goal of the Tåkeheimen hiking cabin, but rounded a corner and realized we still had a ways to go. 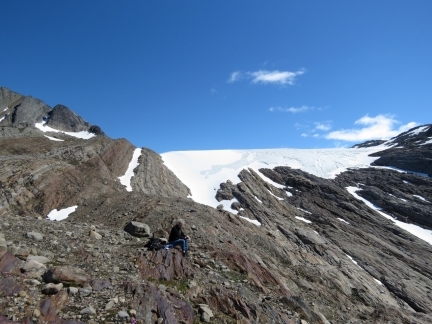 The cabin is just visible in the saddle at roughly the center of the picture (click image for a larger view). 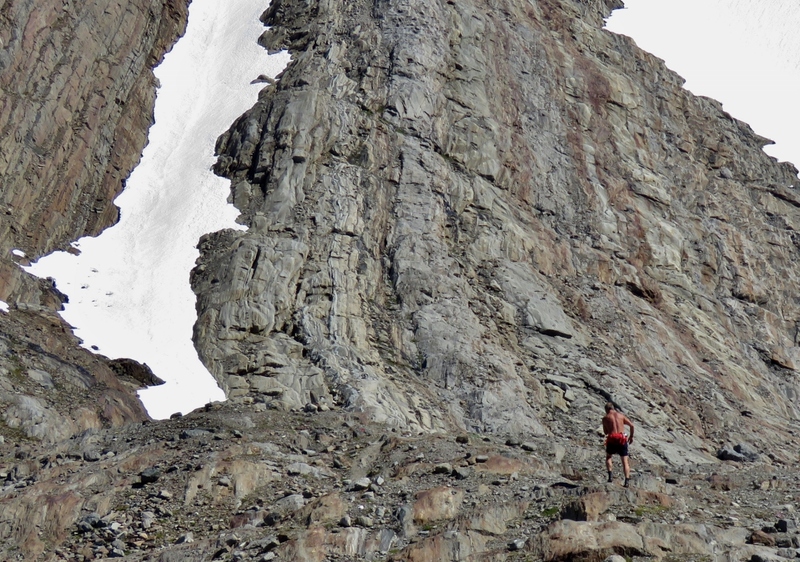 At 2,891 ft (881 m) up we were feeling pretty good about our progress until this middle-aged man literally ran past us. Almost to the Tåkeheimen cabin at altitude 3475 ft (1059 m). It turns out there are two cabins. 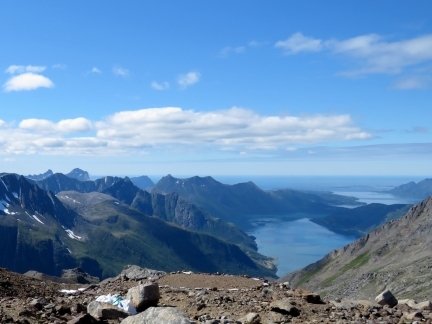 The impressive view down Holandsfjorden and out to sea from the Tåkeheimen cabin at altitude 3524 ft (1074 m). 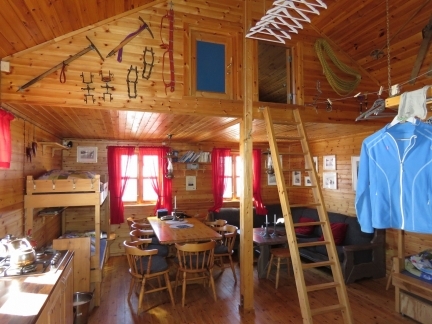 The interior of a Tåkeheimen cabin. Long-distance hiking is extremely popular in Norway, and the Norwegian Trekking Association has built some spectacular cabins throughout the country. Reaching the Tåkeheimen hiking cabins was only the first part of our hike. 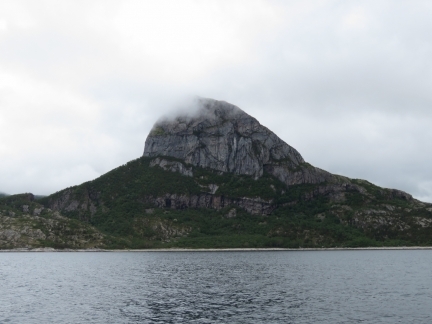 The ultimate goal is 4770 ft (1454 m) Helgelandsbukken. This is the view from above the hiking cabins to Litlebreen, another outlet of Svartisen Glacier. The cabins are hidden by the ridge just right of center (click image for a larger view). 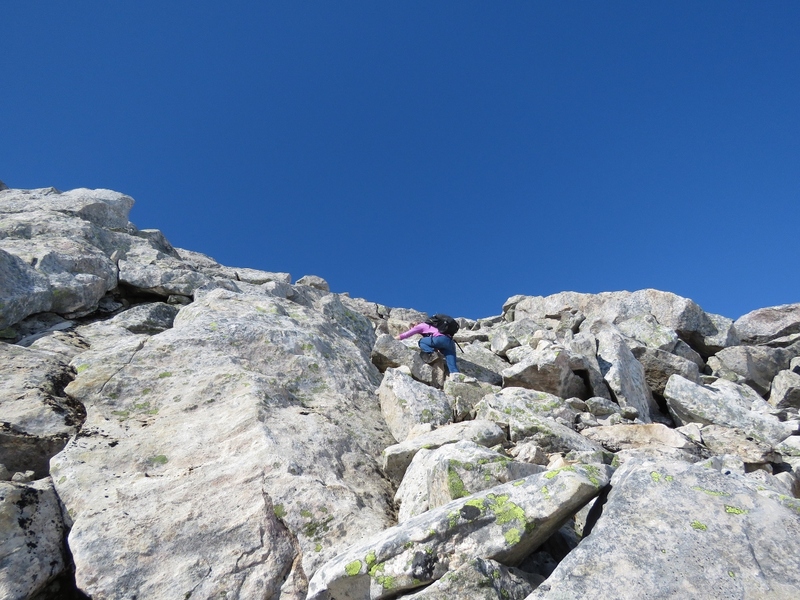 This one small section of the climb was pretty much straight up over huge boulders. At altitude 4151 ft (1265 m), we’re back hiking in the snow again. But its warm enough for us to be wearing just T-shirts. 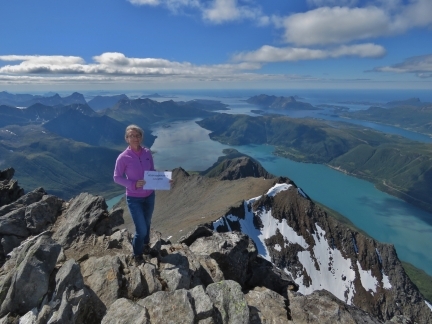 A fabulous view over Holandsfjorden at altitude 4239 ft (1292 m). Taking a break at altitude 4419 ft (1347 m). 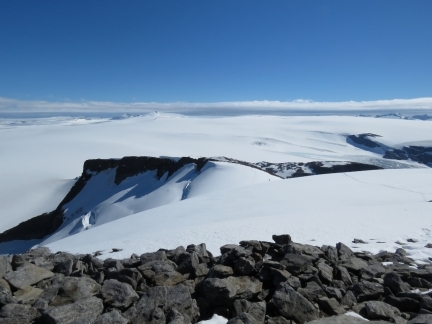 At 4567 ft (1392 m) we reached a ridge where the mountains to the north burst into view. Success! 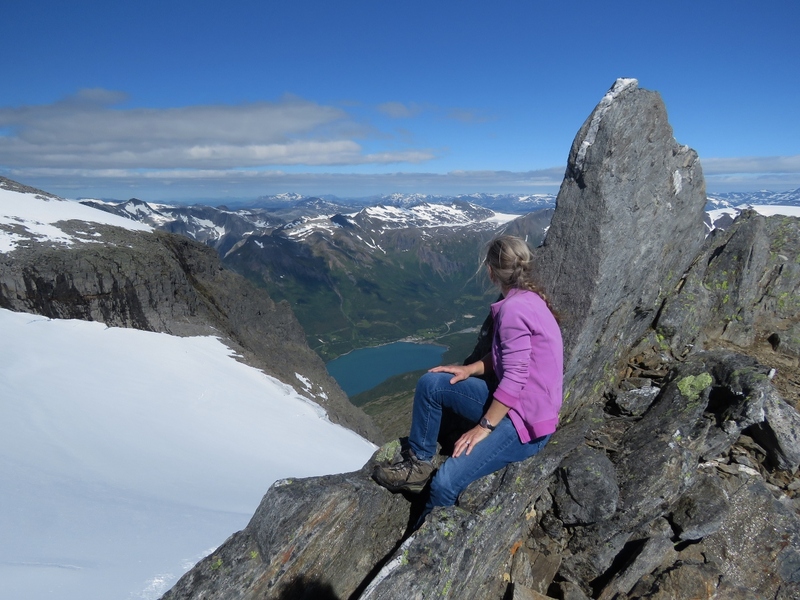 Tired, but super-excited, we reached the summit of Helgelandsbukken at 4770 ft (1454 m). The view from Helgelandsbukken was astonishing. We could see all the way to Lovund and Traena to the west and the Lofoten archipelago to the northwest (click image for a larger view). 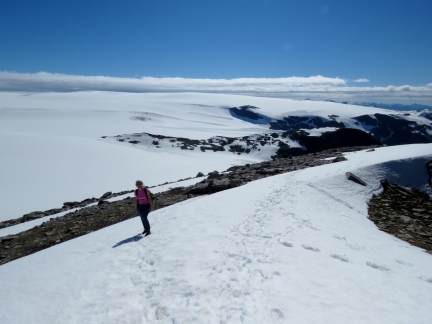 We didn’t think anything could top Dronningruta, but Helgelandsbukken definitely is more spectacular, and more strenuous. Dirona is just barely visible way below us, right of the foreground peak at lower center (click image for a larger view). The guest dock where we landed the tender is farther to the right. Our trail back down snaking off through the snow at the right of the photo. We were pretty tired when we arrived back at the trailhead—we’d gone pretty hard both ways, particularly on the return. It had taken us five hours to reach Helgelandsbukken from here, but only half that to return back down. Here James tire is low on air, so we filled it with a portable pump from our emergency bicycle repair kit. 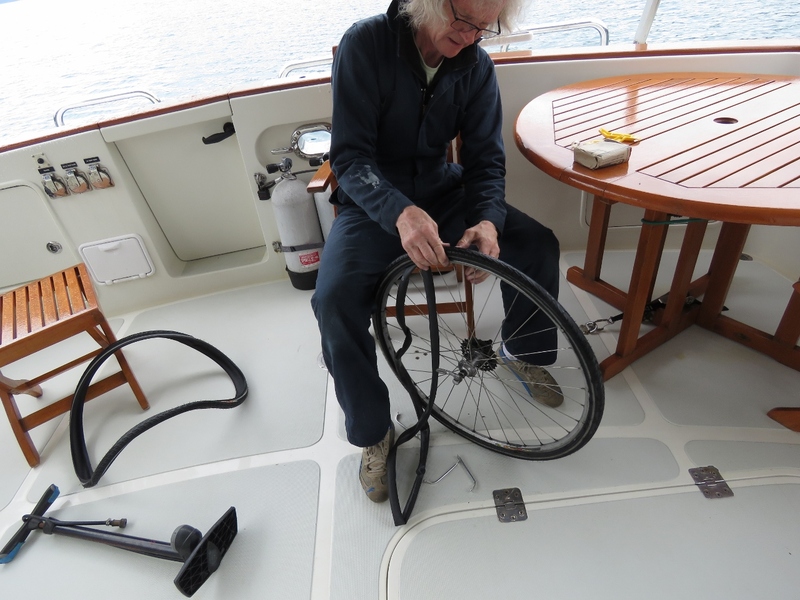 We’ll replace the tube when we get back to the boat. The view to Svartisen Glacier as we return to Dirona. What an incredible anchorage. 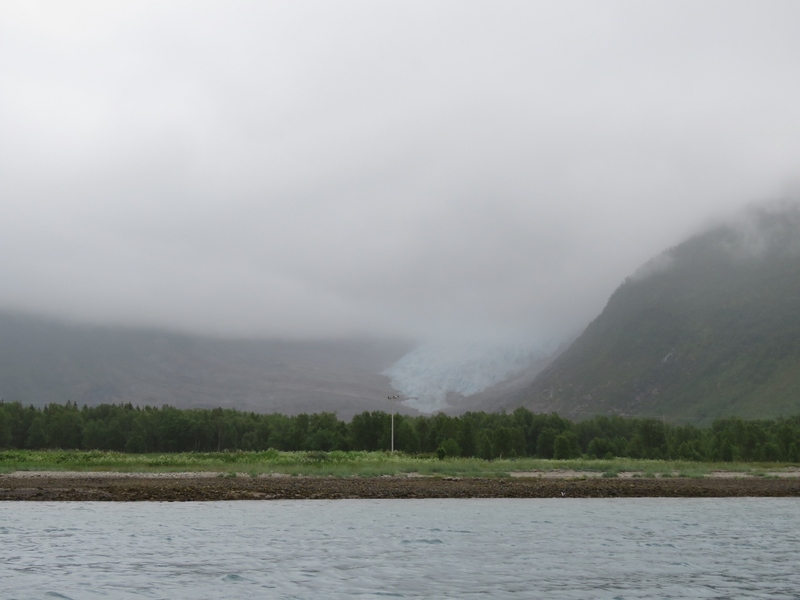 With the cloud line so low, it wasn’t much of a day for glacier-viewing compared to yesterday. 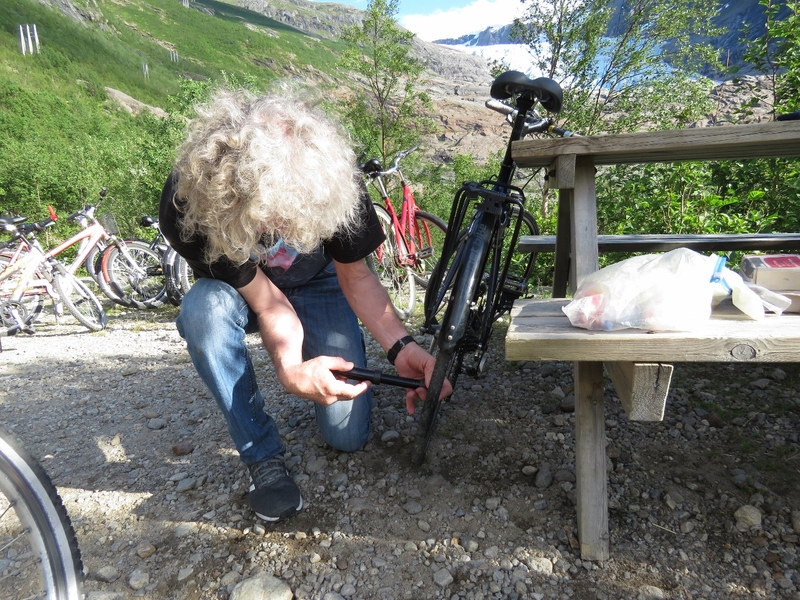 James’ rear bicycle tire went low on air during our ride to the Helgelandsbukken trailhead yesterday. The tube needed replacing, but the tire was also pretty worn, so we replaced both. We’ve gone through a few tubes, but this is the first time we’ve used one of the spare tires that we’ve been carrying since leaving Seattle. 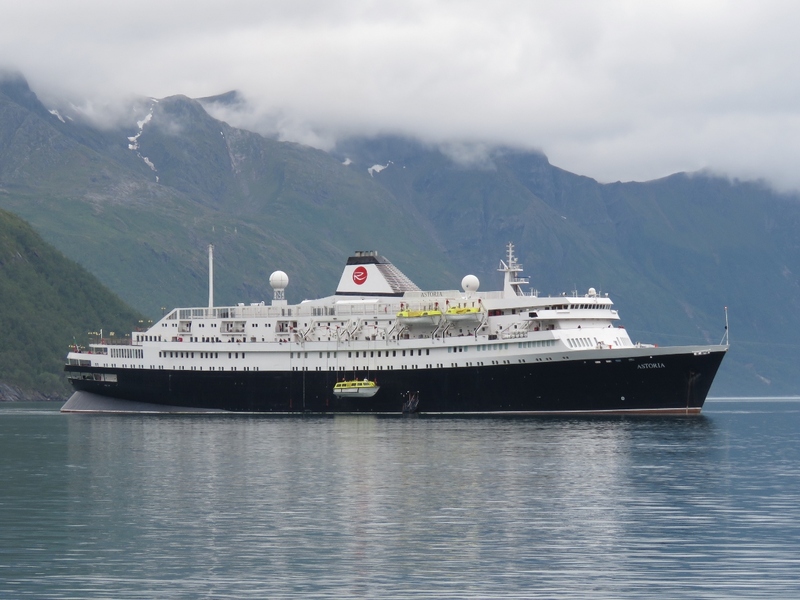 We enjoyed the anchorage so much that we ended up staying for three nights. 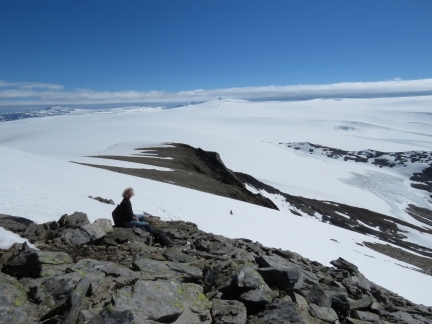 That glacier view is spectacular. I love it when I see you go places I have been. I live in that community you were in. Meløy Kommune is the name in Norwegian. It’s hard to beat the view you must have. We anchored for a day and stayed three. Each morning we got up and looked out the window and said “wow!” let’s stay another day. I know right. Engenbreen (The name of this part of the glacier) is so beautiful you would love to stay there forever! Sad that global warming is melting it. 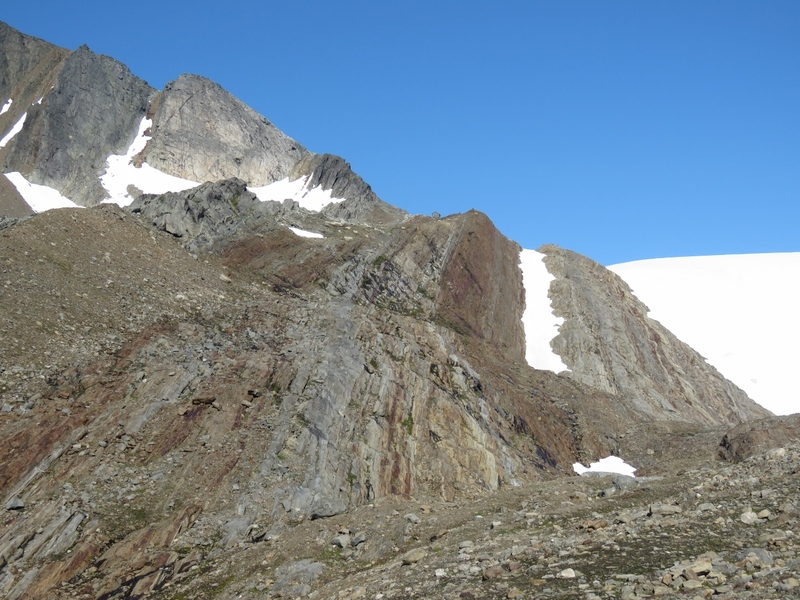 Try searching up pictures of Svartisen glacier from this side in the 1960s. It was much larger then. Someone actually told me that over 100 years ago the glacier crossed that water right by the glacier. 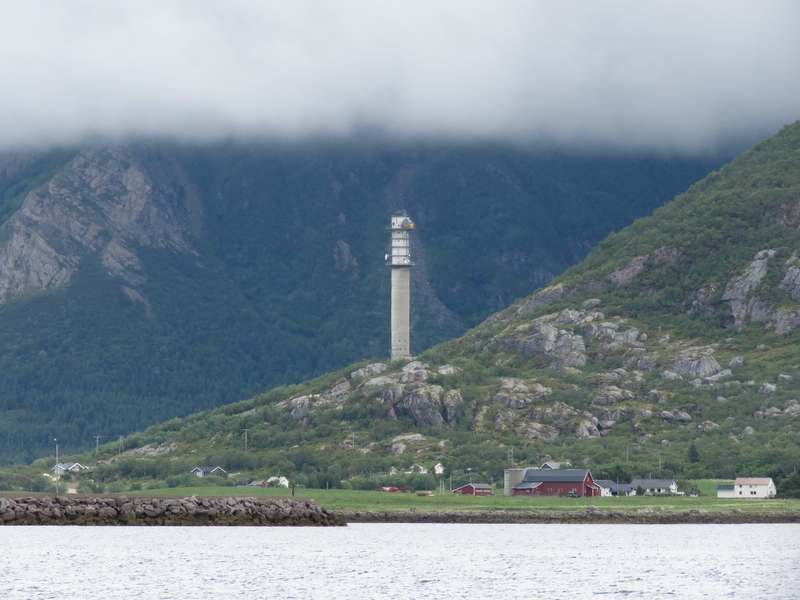 And if you go longer back it reached past Bodø and even longer. 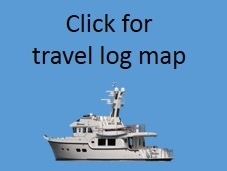 My wife and I really enjoy following your travels and videos. Thank you for sharing them. Thanks for the feedback from both of you.